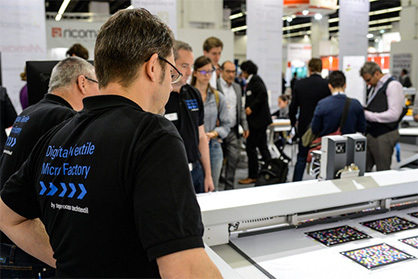 Trade visitors from the fashion and clothing industry, upholstered-furniture manufacturers and all processors of textiles will find at Texprocess, from 14 to 17 May 2019, an even broader range of machinery and methods for processing textile and flexible materials. Once again in its level of bookings Texprocess is exceeding the results of the previous event. "The coming Texprocess will be taking off even further. While on all sides people are talking of Industry 4.0, at Texprocess we are now talking of Impact 4.0. Trade visitors will find an impressive range of technologies which in every respect are having formative effects on the way we manufacture and process textiles, effects which will continue in future", says Olaf Schmidt, Vice President Textiles and Textile Technologies at Messe Frankfurt. Six firms working in several fields – visualisation, CAD cutting systems, automated body-mass calculation, layout and process automation – have also come together under the umbrella concept "World of Digital Fashion." In Hall 4.0 they will be jointly showing the ways in which their products can be integrated and combined in various different workflows within the value-added chain, making the digital process chain into a live experience. The focus will be on the customisation of clothing and fashion. According to information from VDMA Textile Care, Fabric and Leather Technologies, a partner in the Texprocess concept, in 2017 German manufacturers of sewing and clothing technology earned 7 percent more in real terms compared with the previous year, making this the highest export result since 2003. "With export sales of € 603 million, Germany comes in third place among exporting countries, after China and Japan", says Elgar Straub, general manager of VDMA Textile Care, Fabric and Leather Technologies. "Our member firms' technologies are in international demand. Our firms are constantly building up their competitive position. That is because they are continually developing and innovating."